Read 17 customer reviews about CURT Bike Racks that have an average rating of 4.5 to find out what product is best for your vehicle. 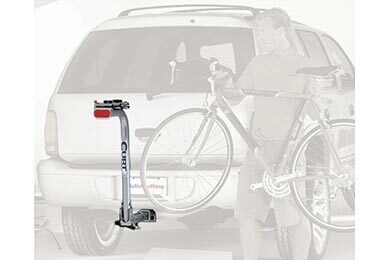 The Curt Bike Rack is easy to install and convenient for loading bikes. I do not believe It could accomodate four bikes unless they are the slimest street bikes available. The rack is very strong and carry more weight than it will every have to but the holders are too close together for four bikes. I use it for two and have plenty of room. If spacing was reconfigured, it could probably fit three full size bikes. Another issue is that most bikes today, other than pure street bikes, have slanted top bars on the frame. When hung on the Curt Bike Rack, the bike will be set on a angle which bring either the front wheel much closer to the groud than the back wheel. The ability to adjust for this angle would be a vantastic feature. Overall, it a strong hitch mounted bick rack that serves it purpose well when you consider it low cost relative to other hitch mounted racks on the market. I may have mine raised to keep my bike's front tire further off the ground during transport. Reference # 754-011-192 © 2000-2019 AutoAnything, Inc.